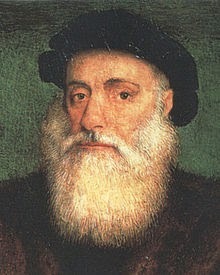 Vasco Da Gama was born in Sines, Portugal in 1469. Estĕvão Da Gama, Da Gama’s father, was put to the task of finding a direct route to Asia. Before the journey could begin however, he died and the task was given to his 28-year-old son. Under the order of Manuel I, Da Gama and four ships left the Lisbon coast for a voyage around Africa to Asia on July 8, 1497. About 170 men went on the voyage including interpreters who spoke Arabic and Bantu languages. There were four priests for each ship and some condemned criminals who were assigned the dirtiest and most dangerous jobs. By July 15th, the crew reached the Canary Islands and on the 26th they were at the Cape Verde Islands where they rested and repaired their ships for a week. a young gentleman and received a good education. chose him to lead an important expedition. Calicut, India the next year, 1498.
brought "gifts" to the native Americans here too. people here. Da Gama tried the same tactic in India, but it didn't work. agreements, with India that benefited European traders in the East. This time, he brought back merchandise valued at millions of dollars. da Gama that many people objected to.